DAPS founders took a vacation out west in the summer of 2014 and made a point to visit the town of Tombstone, Arizona along the way. No visit to Tombstone would be complete without a visit to the OK Corral and the Bird Cage Theater. As many of those who follow paranormal locations know, the Bird Cage Theater is a time capsule that is alleged to be haunted. Many deaths occurred in the theater and elsewhere in this historic town. Both the Ghost Adventures TV show and Ghost Hunters TV show have recorded episodes at the theater and OK Corral. Being devout paranormal investigators, we brought along some special equipment hoping to do a mini investigation at either or both locations. Tombstone is a tourist hotspot so there were and are a lot of people moving in and around both locations. The OK Corral was constantly full of people, so we were not able to do a quick EVP session. We did run off a few dozen Digital and full spectrum photos in the location where the gunfight took place, but were not able to capture anything paranormal. The Bird Cage Theater is full of period artifacts. These are known to hold spirit energy. We were fortunate in that only 3 or 4 other people entered the theater with us, and they all but ran through the exhibits and left the building. This left us with a good amount of time completely alone in the theater. We managed to do a few EVP sessions and take a few dozen photos with the full spectrum camera making our way from the main theater area, to back stage, then down to the private gambling and prostitute area. Some of you may recall if you follow Ghost Hunters, the episode they did in the theater, Grant and Jason claimed to have caught sight of an apparition of a lady in a flowing dress back stage at the top of the stairway leading down to the private gambling and prostitute area, which quickly moved down those stairs and could not be found when they investigated the area. 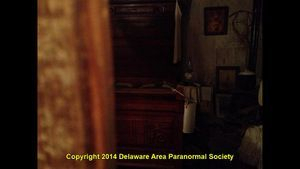 On reviewing our small stash of recordings and images, we did not capture any EVP clips. However, on review of the Full Spectrum images we did find one that we think clearly shows that of an apparition of a lady with a flowing dress teasingly lifting her dress as if to entice a potential male customer. This image was taken by sticking the camera into the small opening they have in the door to one of the preserved prostitutes rooms. This is a very small opening, just big enough to peep into this preserved world, or stick a camera in and snap a few photos. We will present two images below. One image shows what the room looks like with a normal flash. This shot is of the same area in the same room where both photos were taken. The Full Spectrum shot clearly shows an apparition of a woman who may be standing on the bed with her right arm raising her dress up. You can see her body, right arm, and left arm in the image. Update!! While processing other photos from our trip I discovered another photo of this same apparition on a cell phone. We checked the time stamp and this was taken within 30 seconds of the photo below taken with the Full Spectrum camera. It was taken by Kim. See the third photo down. In conclusion, after reviewing all of the photographic, and audio files captured, and in consideration of the paranormal evidence that was found at the location, D.A.P.S. believes that there is a good possibility that the spirit of the prostitute is there at the theater. The absence of any high level physical interactions indicates to us that the haunting events reported at the theater are not demonic or evil in nature. Nothing in the evidence supports that, or any of the commonly accepted scenario's.